I co-hosted a baby shower last weekend for my friend Carlye. I tried to make as much of the food as I could from scratch and the cupcakes and cookies were no exception. The cupcakes were super easy to make and really went over well with the girls. Decorating: Ribbon Chocolates made from Wilton white candy melts and this mold from Bake It Pretty. 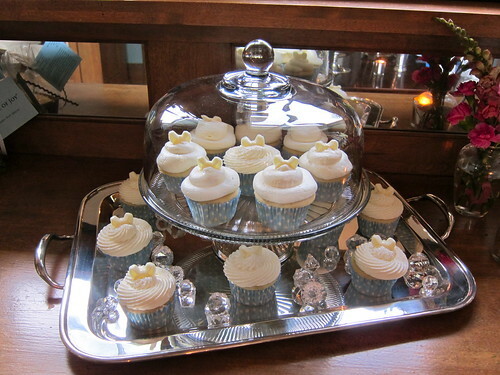 I simply piped the frosting on each cupcake using a giant round and french tip (also from Bake It Pretty). I also sprinkled some with course sanding sugar for a little interest. The cookie decorated almost put me in tears. I love cut-out cookies decorated to the max, but I really struggled with these. I bought this book and used both the sugar cookie and icing recipe from it. The cookies themselves tasted great and really held their shape. The Cookie Craft authors really had some helpful rolling and baking tips in the book that I used and made the process much faster. The icing was another story. I never quite got the viscosity right and they ended up not fully drying out (even after 2 days!). I think the culprit was over-beating and humidity, but I'm going to continue to practice this recipe so I'm ready for Christmas Cookies! Finally we needed favors to send home with all the ladies. I found these cardboard mini-loaf pans from Bake It Pretty (can you tell I love that shop??) and thought they would be perfect. 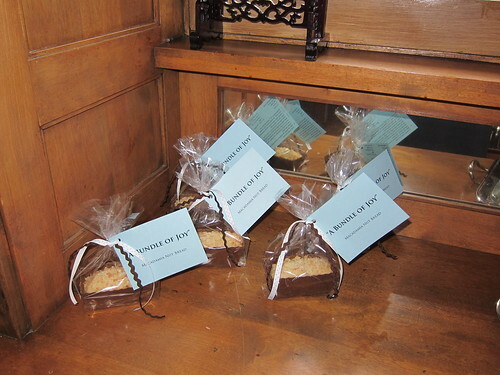 I wrapped them in a cellophane bag and included the recipe for the Macademia Nut Bread on the back of the "Bundle of Joy" card. I hope people enjoyed them. I also made a baby quilt for Carlye, but as luck would have it my camera battery ran out (forgot to charge it after the GLEE concert - more on that later!) and I didn't get a photo. Hopefully I'll be able to snap one in the next week or two and share it on the blog. 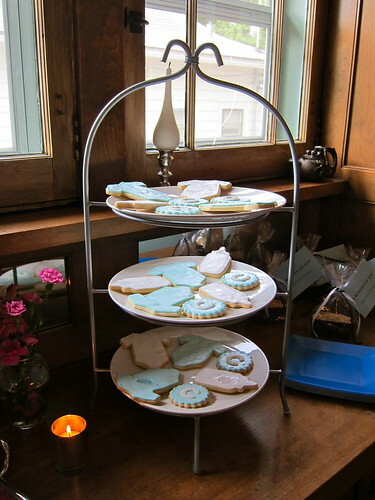 Oh my goodness- I want one of those cookies right now!! I don't even care that the icing didn't dry out! I can't wait to see the quilt pictures. Glee concert??? That sounds fun!!! Everything turned out so nicely...and looked so pretty. I bet that no one even noticed anything wrong with the icing on the cookies as they were busy eating them! The shower was wonderful, and everything was perfect! Thank you so much! How lovely! We just hosted a baby shower yesterday for my cousin! I'll be posting a post later today!!!! 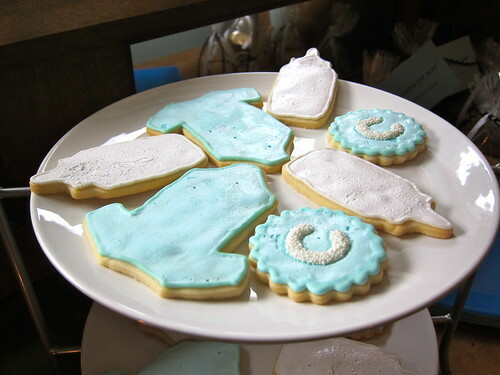 We had cupcakes and cookies too- shaped like onesies!! I'm sorry to hear about the cookies. So I made our cookies Wednesday night. Then i frosted them with our neighbor on Thursday night. I used the frosting recipe from Sugarbakers and i did outline then flow and then outline again. I used more water than it said. I let them dry from Thursday night until Saturday and they did dry completely. I did not bag them until Sat. morning. Last time i only let them dry overnight and even though they seemed dry, once they were bagged, they softened. So, this time i gave it a few days. I also didn't beat the frosting for the full 4-5 min as it said. If it is really humid, that doesn't help either. Are your cookies pretty dry? I use a Martha recipe. Here's the link to our first shower post...I'll do two more in depth ones on the food and then the desserts. I had lots of helpers though. Can't believe you did yours all on your own! Hope the Glee concert was fun- i'm jealous! !